February 5th 1928. 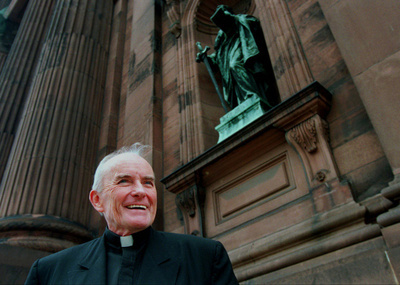 On this day, Catholic priest and novelist Andrew Greeley is born in Oak Park, Illinois. Greeley was raised in an Irish Catholic community in Chicago and became a priest in 1954, at age 26. He took a doctorate at the University of Chicago, where he later taught sociology. A relatively liberal priest, he came into conflict with the increasingly conservative church hierarchy and was outspoken in his support of women's roles in the church and of birth control. He engaged in a 17-year-long feud with a cardinal in the Chicago archdiocese. Meanwhile, he wrote nonfiction books on religion and sociology, and in the mid-1970s he turned to fiction. A short story he wrote entitled "Ms. Carpenter," about Mary, mother of Jesus, took first place in the Catholic Press Association's short story contest in 1978, and a year later he published a book, The Magic Cup, an Irish Legend. Greeley's breakthrough novel was The Cardinal Sins (1981), about two young men from Chicago's West Side who become priests at the same time. The book became a bestseller, and Greeley followed it up with at least one novel a year for the next 15 years. Among his many works are Thy Brother's Wife (1982), Angels of September (1986), Wages of Sin (1992), and Irish Gold (1994). Sometimes criticized for the relatively high sexual content in his books, Greeley told critics that he attempted to portray real life, while subtly demonstrating the influence and power of religion. He donated much of the wealth brought by his books to charity. Among his donations were a $1.5 million endowment to the University of Chicago for a chair in the sociology of religion, and a $1 million grant to inner-city Chicago schools. Greeley is also an active nonfiction writer, who has published more than 100 nonfiction books. Here is a priest who, in the best Catholic tradition to which he remained faithful throughout his life, demonstrated the interrelationship and harmony between literature, theology, and philosophy. That tradition goes all the way back to Aquinas whose Summa teaches that faith and reason can be friendly to each other.